In an Elseworlds animated adaptation, Batman is on the trail of the infamous serial killer Jack the Ripper when he lands in Gotham. This new trailer for the upcoming Batman: Gotham by Gaslight takes Bruce Wayne, Selina Kyle, and Alfred into Victorian times. Based on the first Elseworlds series of non-continuity stories featuring DC Comics heroes in alternate realities, Batman: Gotham by Gaslight was written by Brian Augustyn, with art by Hellboy creator Mike Mignola in 1989. The animated film doesn't adapt Mignola's visual style unfortunately but does look distinctive enough to enjoy seeing Bruce and Selina in some dapper Victorian garb. It's rated R for "some violence" which has become DC's newer more mature line of cartoons like the dreadful 'Batman: The Killing Joke' and the PG-13 rated 'Batman and Harley Quinn.' The violence here is warranted because of the subject matter, Jack the Ripper was an unknown serial killer of at least five prostitutes in late nineteenth century London. The trailer seems to indicate that Jack is in Gotham using similar methods. DC is going to need this to be a hit for the once formidable animated division. It's already squandered the buzz of the Wonder Woman live-action movie by not capitalizing with an animated follow-up to the 2009 release. Everything Batman has been DC's cash cow in every medium but at the expense of other characters. With 'Justice League' coming out November 17, it can't ignore broadening its offerings with vehicles for Aquaman and Cyborg. The Flash already has a live-action television show and Wonder Woman will have a sequel to this year's megahit solo film. That still leaves a deep catalog of characters to feature in comics and animation. Shazam is another planned big screen adaptation so an introduction in animation wouldn't be a bad idea either. 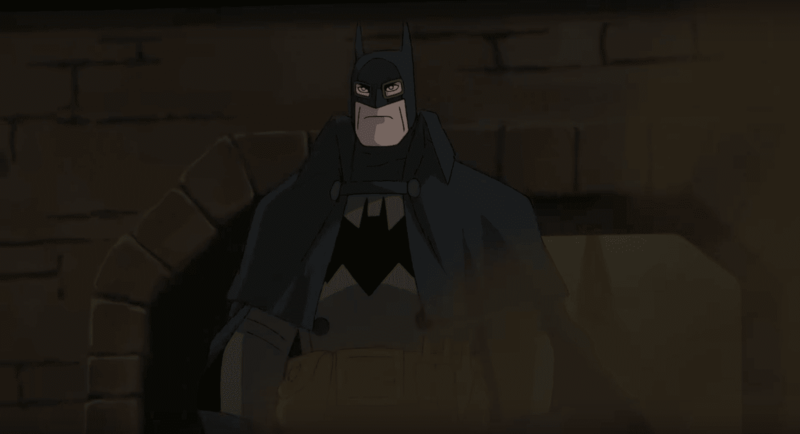 'Batman: Gotham by Gaslight' is expected on Blu-ray and DVD in Spring 2018. Voice talent includes Bruce Greenwood as Bruce Wayne / Batman, Jennifer Carpenter as Selina Kyle, and Anthony Head as Alfred Pennyworth.